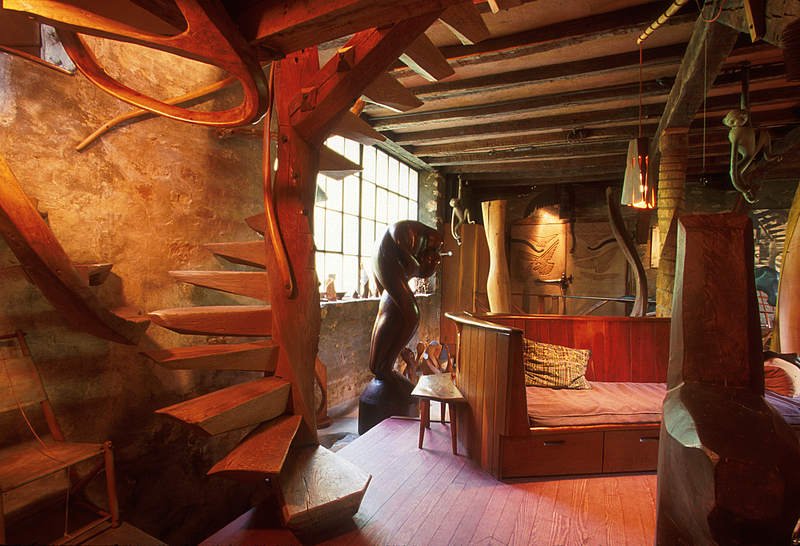 Interior of Esherick house. Photo by G. Widman for GPTMC. In the bucolic countryside near Valley Forge sits a modest house in the woods. It was once the home and studio of Wharton Esherick (1887-1970), America’s foremost wood sculptor and furniture craftsman. Whether or not his name is familiar to you, a visit to what is now the Wharton Esherick Museum, a National Historic Landmark in Architecture, is a mesmerizing experience and a look into one man’s wonderfully idiosyncratic environment. Esherick’s work is considered the link between the Arts and Crafts Movement and today’s Studio Furniture Movement. 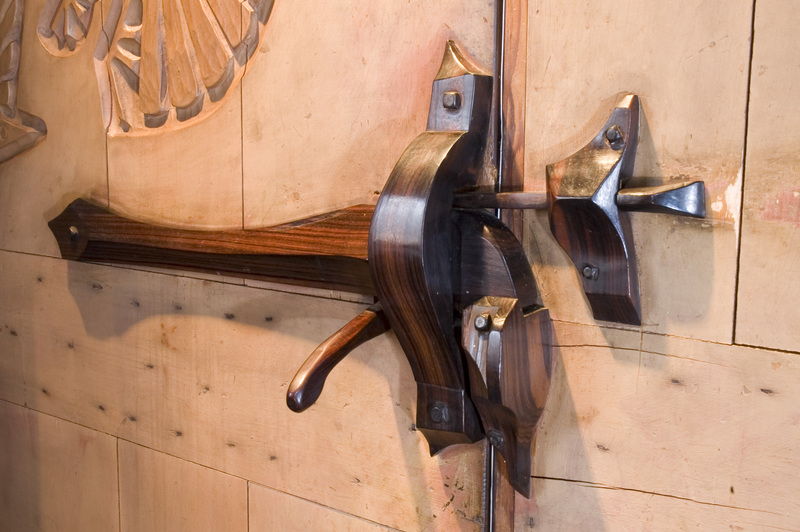 His legacy lies not in having established any particular style — his own unique styles were always changing — but in paving the way for successive generations of artists working in wood to exhibit and market their original designs. In 1926 Esherick handcrafted a stone studio space on a hilltop in Paoli, Pennsylvania, and over the next 40 years he added living quarters, storage, and an outdoor deck. 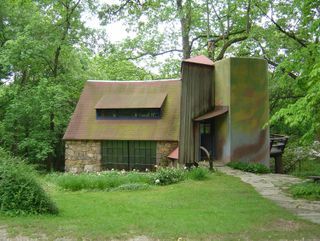 The result is a surprisingly cohesive amalgam: part Arts and Crafts-style stone barn, part weathered-wood house, and part curvilinear stucco tower, which Esherick painted impressionistically to blend with the surrounding foliage. Never one to like straight lines, he designed the roofline with a gentle bow (a nod to the local barns and their sagging roofs) and stone walls that widen slightly at the base, like tree trunks. In a final flourish, he painted the front door a deep plum. Loading door latch, macasser ebony, 1926. Photo by James Mario. Past the purple door, visitors enter a compact, multilevel house containing some 200-plus examples of the artist’s work — sculptures in wood and ceramic, furniture, paintings, woodcuts, and prints. 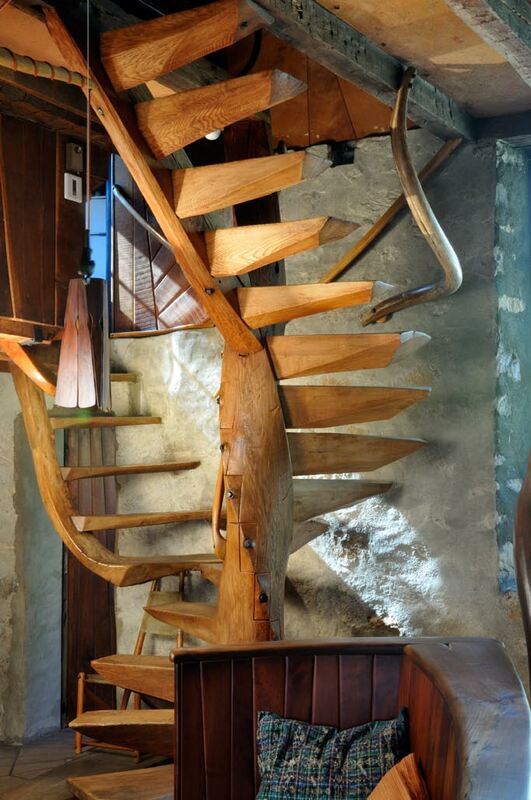 But the collection doesn’t stop there: Remarkably, Esherick also carved, forged, or otherwise crafted most every object in the house, including floors, cabinets, lamps, doors, sinks, latches, hinges, light switch covers, salad tongs, and the hands-down masterpiece — a two-story spiral staircase hand-hewn in red oak. The works trace the various trends Esherick explored over the arc of his career — from the organic simplicity of Arts and Crafts to the geometry of Expressionism to the lyrical freeforms for which he is best known. A visitor’s first stop inside the house is the living room, a warm, woodsy space with leafy views. There you’ll see a double music stand of cherry and walnut, its lines like tree limbs, and an oak desk carved with delicate representations of the trees just outside the windows. The room overlooks a sculpture well that Esherick constructed to display taller pieces, such as Oblivion, two intertwined lovers carved from walnut. Spiral Staircase, Red Oak. Photo by James Mario. A turn up those extraordinary stairs (more comfortable to climb than they may look) leads you to a round-ish kitchen (it’s in the tower that Esherick called his silo), the dining room, and a door to the deck. Curvy trays, pots, and cutting boards, all designed by Esherick, dangle from the kitchen ceiling. Much of his furniture has a tactile appeal, and in the dining room visitors are invited to feel the seamlessly smooth table of oak with cottonwood and walnut insets. Beneath it is a spectacular floor, a mosaic made from scraps of applewood and walnut. The final turn at the top of the stairs takes you into the master bedroom, where a high, two-poster bed next to a panel of windows afforded Esherick a dramatic view of the valley below. A lifelong naturalist, he always kept a copy of Henry David Thoreau’s Walden by his bed. In a house chock-full of charming details, one of the most endearing is in the short hall between the bedroom and the bathroom, where a set of six wooden coat pegs in the wall commemorates the construction of Esherick’s original stone studio. Four of the pegs are carved in likenesses of the four craftsmen who helped him with the project, one is a self-portrait, and one depicts a bird that perched in a nearby tree and sang each day as they worked. A native Philadelphian, Esherick had already trained in metalworking and drawing by the time he entered the Pennsylvania Academy of Fine Arts to study painting. But by 1920 he’d found his calling in wood: He began carving decorative frames for his paintings, then woodblocks, then wood sculptures. In 1926 his sculpture was exhibited at the Whitney Museum of American Art in New York. Around 1928 Esherick began to design furniture that he considered sculpture and was soon receiving large commissions for furniture, interiors, and sculptural living environments from a core of loyal customers. An exhibit at the 1939-1940 World’s Fair in New York drew national attention, as did a 1958 retrospective at New York’s Museum of Contemporary Craft. Today his works are in the permanent collections of several major museums. The Wharton Esherick Museum is located in Paoli, Pennsylvania, 25 miles from Philadelphia, just west of Valley Forge National Park. The museum is seen only by guided tours reserved in advance. To get directions and make reservations, call 610/644.5822. For more information visit www.whartonesherickmuseum.org.